A review of the new Fuzzibunz One Size diaper compared to the old style. See how they size up against one another. I’ve been out of the cloth diaper scene for a few months now since Moreaya potty trained. It was really my life for the last 4 and a half years so I have a lot of experience with cloth diapers, but I swear things have really changed in just the last few months, including one of the biggest changes in one of the top brands on the market… FuzziBunz! FuzziBunz Cloth Diapers were one of my favorites with both girls, specifically their Perfect Size Diapers. Although I loved the concept of an One Size Cloth Diaper, those perfect sizes just gave us the best fit, so I had quite a few in our stash. Just recently, FuzziBunz changed ownership and with that decided to totally re-design their One Size Cloth Diaper and they sent me a couple to share with you! 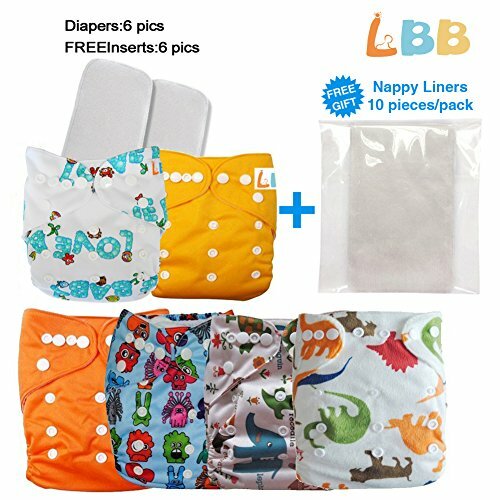 While some might call this post a review, please remember that I don’t have a child who is currently wearing cloth diapers so I’m talking mechanics of the diaper only from seeing them up close and personal. I wish I still had one of the older styles of FuzziBunz One Size Diaper or their Elite to compare with the new style, but alas, I’ll go with my memory and share the differences in the new style PLUS some of the great new features of the new One Size. The first most noticeable difference is… there are two of them! Now I know you may be thinking “How is it really a One Size Diaper if there are 2 sizes?” Let me explain. One size diapers that truly give a fantastic fit in just ONE diaper are rare… very rare. In fact, I can only think of one brand that’s managed to make a diaper like that and it’s a bit price-y. Look at the difference in a 6 pound newborn and a 35 pound toddler. It’s obvious that they are proportioned differently and just aren’t going to wear the same size. 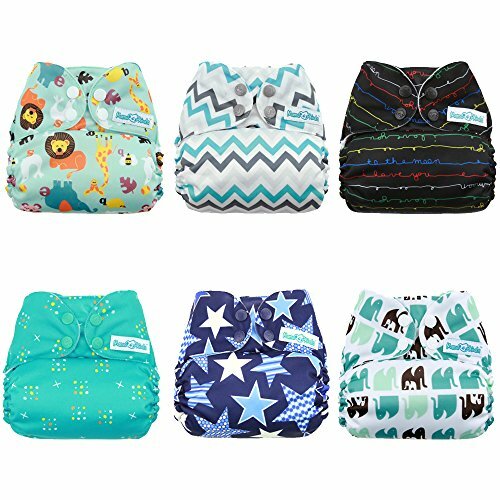 FuzziBunz took those size differences into consideration and felt that by making 2 sizes of the One Size diaper, they would truly be giving the best fit for the most economical price. Perhaps one of the most difficult areas to get a good fit with One Size Cloth Diapers is the area between the legs. The crotch width is definitely where a one size diaper has a hard time fitting on a 6 pound newborn. A wider crotch width is needed for older toddlers, but for little babies it makes their little legs seem so spread apart and honestly looks completely uncomfortable. As you can see from the picture above, that width is one of the main differences between the Small and Large FuzziBunz One Size Diaper. The Small size is recommend for 7 pound infants to 30 pound toddlers. The Large for 10 pound infants to 45 pound children. As you can see there is definitely an overlap of sizes, which can help you decide which size is right for you. In a lot of cases, I would imagine that parents would still only need to buy one size of the new One Size FuzziBunz Diapers. Along with the crotch width, one other really noticeable size difference is the insert. The Large insert is considerably larger than the Small insert and I did have a bit of a time stuffing the Large insert in the diaper. The contour-shaped insert is different than the original rectangle shape, but I actually tend to like inserts that are shaped this way. Now, let’s look at some of the changes that have been made from the older versions to the new. Wider Waist Band with double stitching [and heavier thread] which increases durability and quality. Reinforced button and snap sewing and snap placement adjusted for a better fit. Outer is still a waterproof PUL, but comes in new, fashionable colors. Pocket opening now features a softer elastic which makes stuffing the pocket easier and provides a cleaner look. 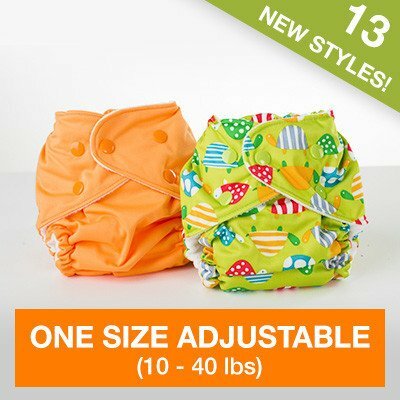 Remember – this is still an adjustable one size diaper, even though there are 2 sizes available. The adjustment system is also still the same – using the button and hole system to adjust the leg and waist elastic. The new FuzziBunz One Size Cloth Diapers are available for purchase on Amazon.com. What do you think? Do you like the re-design? I really like the Contour-shaped insert and the new sizing. I would love to try it.They look really cute. I really like the new design. I love the Contour-shaped insert and the new sizing. Thank you for the feedback, Briana! I will look into it! I have one very old style Fuzzibunz, but it is in horrible condition (it was given to me), and I have rwally been wanting to try the newer styles out. I love this concept and would love to try one out! I liked the concept of the the button elastic used to adjust the rise rather than rise snaps and was sad that the old Fuzzibunz Elite didn’t seem to fit our baby very well so I’m excited to try out the re-design! I’ve never tried them but I would love to try them. I love the wider waistband. That is great!!!!!!! The new design looks AWESOME! Very nice! I’d never tried them before but I would like to! I think the concept is smart! Would love to try this brand with the way the elastics are! I don’t have anything like that! I like the adjustable legs and the sized system always seems to work better for my kids! It sounds like they made a really good decision making these in two sizes. I love one size! Excited to try them! From what I can tell these diapers no longer have the leg elastic. While they made the crotch a different size, I still like the customizability of the leg elastic in the older model. I’m totally new to cloth but I think these are really great! I wasn’t really familiar with them before the redesign but I’d love to give them a try. I like the looks of the new design. Been having problems with trying to find the best fit to my little one, Hopefully this will work. I have never tried FuzziBunz but I love that they come in 2 sizes because I have a very large baby that never fits into onesize diapers. I usually have to buy extenders for her waist! I haven’t used CDs yet, but am hoping to soon. I love the contoured features as it sounds like they help with a close fit. I love the small size I think they fit so well. They look really interesting. I have never tried OS diapers that work like that. They would be cool to try out though. I have never tried any Fuzzibunz but these look like great diapers! I’m always a fan of one size. The two different sizes is interesting. I’d definitely like to try. I love the idea of the contoured insert! I’m new to cloth diapers, and have yet to try this type of diaper, but it looks like something I would like! 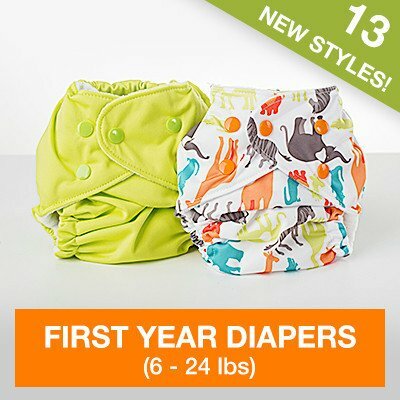 I am looking into one size cloth diapers! Thanks! I really like the idea of the two size concept exp since theres no snap down to make it shorter. We have the older fuzzibunz os and perfect size. Id love to try these. I’m eager to try one. I like the new design! I like the 2 size concept. The contoured insert will hopefully be better than the old ones for stuffing! I have the 2013 Elites, and I’d be interested to see how these compare. I like the redesign. I’m wondering if the large will fit my 4 year old daughter. She has cerebral palsy and is still in diapers. Would love to try it out on her before making a purchase! This would be a first for my great granddaughter….. I like the new contour-shaped insert in the new Fuzzibunz diapers. I hope the PUL is stronger. I really like the new design! I have the old old style mediums and love them. So I am sure I would love these. I like that they have adjustable elastics!! Haven’t tried them, but would love to! I hope these are better than the previous “promise these are actually good” variations. The perfect size diapers are awesome and are our go to diapers, but I have been burned too many times on Fuzzibunz failed attempts at a suitable OS. Really only interested in trying these if they are free. I had tried the OS Elite on my daughter and couldn’t get a good fit. It was HUGE on her, as she’s very petite. So, I’d be very interested in trying the new OS Small! I love FB diapers we used the exclusively with our kids and I’ve been dying to try the new One Size Diapers! I have been using the 2013 one size for my son, as well as some older older ones that mom passed me from my two youngest siblings. He’s grown out of the old ones, and we are down the the 2013 one sizes. Gotta do laundry more often. I am due with my next child in February and would love to get more before hand, especially some more of the smaller one sizes. I love that the size two has so much more life in it. I have a big boy and we are having a hard time continuing to cloth diaper him. I love the new sizing! My babies tend to be larger so I’m excited to try the large! I’ve been wanting to try fuzzibunz and am even more eager to try this new style especially. I haven’t tried them yet, but I’m eager to try one. I like the new design! I love the idea of having two one size diapers. I tend to have thinner, smaller babies and a lot of one size diapers are still very bulky on my 13 pound four month old. I think your small one size will be perfect to get him to potty training age. Its a different for sure. I have quite a few one size I wonder how easy it will be to adjust with a growing baby. First time mommy and like a chance try out diaper. I love the new redesign. They seemed to have really put a lot of thought and consideration to revamp the product into something superior. I really like the new design, it looks like it would be very soft and comfortable for baby. This looks like such a quality product! I am new to the CD game, but I would definitely like to give these a try.